Airports are essentially free-standing, highly sophisticated and highly regulated cities. And because of that, Maximo Airport implementations are intricate and must be planned accordingly. This post, written by David Dawson, Interloc's EVP of Professional Services, will review some of the important operational interdependencies that your airport is faced with when considering a Maximo implementation. We will also provide some best practices to consider when you undertake your Maximo implementation. As an airport, you have to manage literally hundreds of thousands of assets of a wide variety with stringent regulatory compliance requirements. Water treatment facilities - potable and grey-water, sewage lift stations, HVAC that typically includes massive cooling towers, water transfer enabled by immense engines, electric power that typically includes both high and low voltage substations and distribution, and complex lighting networks. Gas distribution, water distribution - not only the heating and cooling of the entire complex, but potable for restrooms, etc. Owned space, leased space, tenants, grease and oil collection systems and separators, deicing equipment and drainage/runoff areas for glycol. Glycol, once collected, can be processed and recycled. Human transport, including elevators, escalators, moving walkways, and sometimes light rail or tram operations. Airfield and surrounding infrastructure - taxiways and runways, roads, bridges and other concrete or paved surfaces - and there are usually miles of them. Any surface that an aircraft can move on is highly regulated. Meticulous tracking of the condition of each and every one of the concrete panels (often thousands of them) for cracks, spalling, heaving and/or any form of misalignment. Police and Fire departments, and typically a very significant fleet of equipment that might range from weed-eaters to extremely complex snow removal vehicles. Equipment and asset inventories often consist of more types of rotating (re-buildable) equipment than any other industry. Many types of equipment and inventory must be tracked down to a very granular level, often due to the regulatory requirements imposed, and the fact that much of the equipment must maintain a clear and traceable lineage - from cradle to grave. Additionally, many times airports are constructed on a “low bid” basis. That can imply that much of the equipment is a manufacturer’s older version or obsolete the day it's received. Further, airports are routinely forced to add on to their buildings and grounds perpetually, to accommodate ongoing growth, resulting in a potential lack of standardization over time, massive inventories of material to service, and maintenance of a wide diversity of equipment. If not managed correctly this cycle can lead to millions of dollars of “phantom” inventory scattered over the entire facility – unknown, and often untraceable. Designing a Maximo implementation to satisfy the requirements for all of these business units requires industry expertise. The diversity of not only the work, but also the equipment - and how it's regulated, maintained, and the level of FAR reporting required - is among the most stringent of any industry, and rightfully so. Airports are serious business, and the job must be done right – every time. That diversity alone often requires several individual and specific Maximo designs for each of the common applications used within it to plan, schedule and manage work – not to mention assuring compliance with the many federally mandated regulations. Maximo is a facilitator to maintaining airports – capable of providing the right information at the right time, assuming it is designed, used, and “fed” correctly. A successful airport implementation requires a careful modeling of the entire business, so that nothing is missed. That business model then becomes the source from which the correct Maximo design is derived. This insures not only a match between the tools (Maximo) used to track, measure, and manage the airport’s performance, but also the ability to capture and analyze such information to enable intelligent business decisions as the airport grows and improves. Finally, many airports face the threat of privatization. Maximo, designed and implemented correctly, can provide the means by which the airport can successfully defend and justify its manpower, expenses, and ultimately the rates and billing to tenants and airline customers. 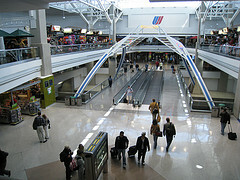 Interloc has experience with Airports – both large and small. We would be pleased to talk to you about your current and future needs. Whether it’s a functional, business process or technical question, Interloc stands ready to provide a no-charge assessment. Gain greater visibility, improve interoperability and drive efficiency into your airport operations. Contact Interloc today or learn more by visiting our industry pages.